Julia is a new mid-season variety raised by H.R.I. East Malling and is a superb addition to our list of varieties. Cropping about a week later than Glen Moy, the yield is very high, outyielding Glen Clova by some 36%. 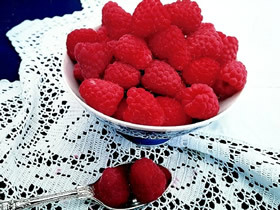 The fruits are large, attractive and well shaped, easily plugged and a lovely dark pink to medium red in colour. Fruit is well displayed on the erect canes and very easy to pick. Julia has an exceptional health record and has resistance to the Aphid Virus Vector, Spur Blight and Cane Spot. Raised as a replacement for Glen Clova, the yield is much higher, the fruits are larger, the flavour is better, the texture is superior. Ideal for the exhibitor, good for jam making as the seeds are bold, perfect for all dessert uses with the true raspberry flavour. Julia is a new variety that is going to be with us for a very long time. Highly recommended. Don't delay in ordering this variety. It's magnificent.